Shutter mechanical central type shutter with 3 blades, between the lenses. Cocked with separate lever. Viewfinder Reflex viewfinder with viewfinder lens 1:2.8, viewfinder hood and lens; frame finder. inf. 18.0 - inf. 11.0 - inf. 8.5 - inf. 6.0 - inf. 4.5 - inf. 3.3 - inf. 10 7.0 - 20.0 6.0 - 30.0 5.0 - inf. 4.0 - inf. 3.3 - inf. 2.5 - inf. 5 3.9 - 7.0 3.7 - 9.0 3.4 - 12.0 2.9 - 17.0 2.5 - inf. 2.0 - inf. 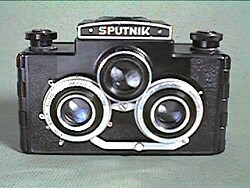 The Sputnik is a camera of many design faults. The most serious are light leaks, internal reflections and lens flare. Sam "3D Hacker" Smith has found ways to improve the perfomance of this camera. Information about modifying the Sputnik is available here with the kind permission from the author. In 2013, Shane Blomberg created strap lugs, facilitating outdoor use.